Jorja finally got to enjoy her huge bone from Arlette, our housekeeper. It was so big she had to wait for Spring and her 3rd B-Day (3/21). It’s gone now because pieces started to break off, bad for the intestines. She enjoyed it! Mommy’s blanket from Deborah! We both love it! So happy that fast decision came to fruition. She is my replacement for Mitchell, our son, graduating from Univ. next month. Jorja is such a joy!. Thank you!!! Breeder’s Note: We are blessed to know she is with you. I am sure Mitchell is glad you have a special family member that shares your life in his absence. We think of you often, and of course she is a litter-mate to Jazz. She doesn’t live far from us: since Chris (who takes care of the hay) comes by with her every once in while, we see her in person. They adore her too! 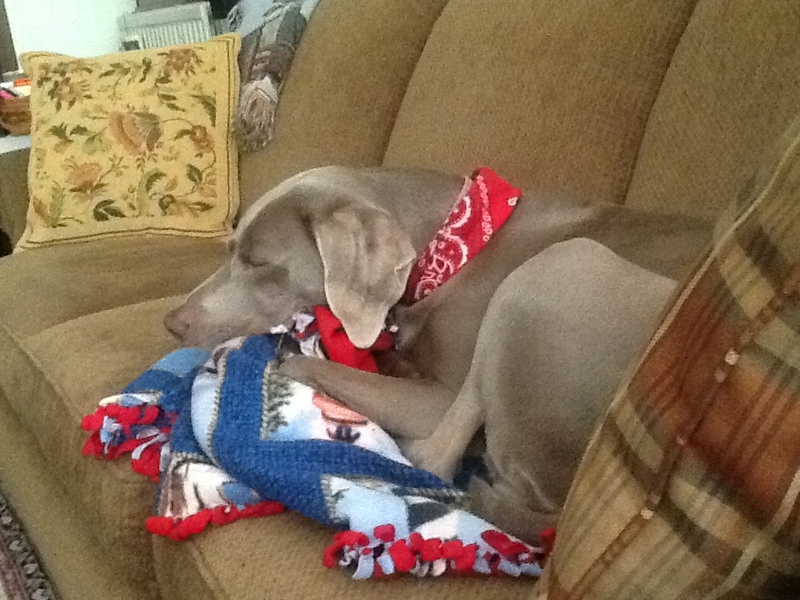 Posted on April 23, 2015, in Previous Pup Update, Rosie X Zee and tagged European Weim, Family Companion, Healing Weimaraner, OwyheeStar, OwyheeStar in Belgium. Bookmark the permalink. 2 Comments. Oh I remember, Jorja was the one who caught this giant rat once, right? I bet that’s a bone of that rat, it was huge! Yeah–closer to beaver size I think. Hmmmm maybe you are correct. The rat left the bone. Chewer beware.